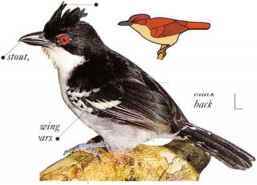 A heavy bird with a sluggish appearance, the Fasciatcd Antshrike hunts insects in vine tangles at the rain forest edge. 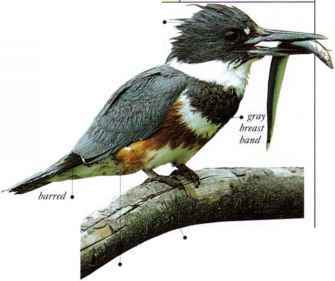 • NliST A cup nest situated in a bush or a tree fork. • distribution From Honduras through Colombia as far south as N.W. Ecuador. On east side of Andes, from Colombia to n. Bolivia and Brazil. 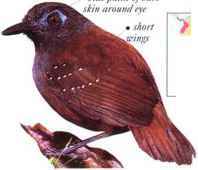 Living in the undergrowth of secondary forests (regrown after forest clearance), this species usually moves hookeei about in pairs, hopping ^U through thickets, and pausing to peer after their insect prey. 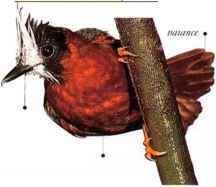 • NliST An open cup nest made of grass and leaves, suspended by its outer rim from a twig in a low bush or thicket. • Distribution From s. Mexico to Brazil and N. Argentina. Ibis thickset bird hops about in the dense undergrowth of forest edges, or sometimes in clearings with bushes. It snatches insects and spiders with its stout, hooked bill. • NliST A cup nest of grass and leaves, built into a branch fork, and hidden in the undergrowth. Brazil, and neighboring countries north to Colombia and south to Bolivia. 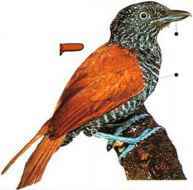 1 his lowland rain forest bird sometimes forms large flocks. It can often be seen following army ant swarms and clinging to vertical stems, before swooping on insects disturbed by the advancing ants. • NEST A cup nest inside a mass of dead leaves in a bush. DISTRIBUTION to the west and north.